Who says learning can’t be fun? Certainly not the leadership team at Ambition who delivers “inspired play” in six-day immersive programs at the National Flight Academy located in Pensacola, Florida. It all starts with the story – a heart-pumping, adrenaline-filled mission with squadrons competing to successfully finish a task. Whether it is a race or rescue, science, technology, engineering, and math (STEM) skills are used in tandem with the equally important 21st Century learning skills including critical thinking, problem-solving, teamwork and communication to advance the team. Since opening in 2012, more than 2,600 students from 44 U.S. states and seven countries have come aboard Ambition to participate in its next-generation innovative play. 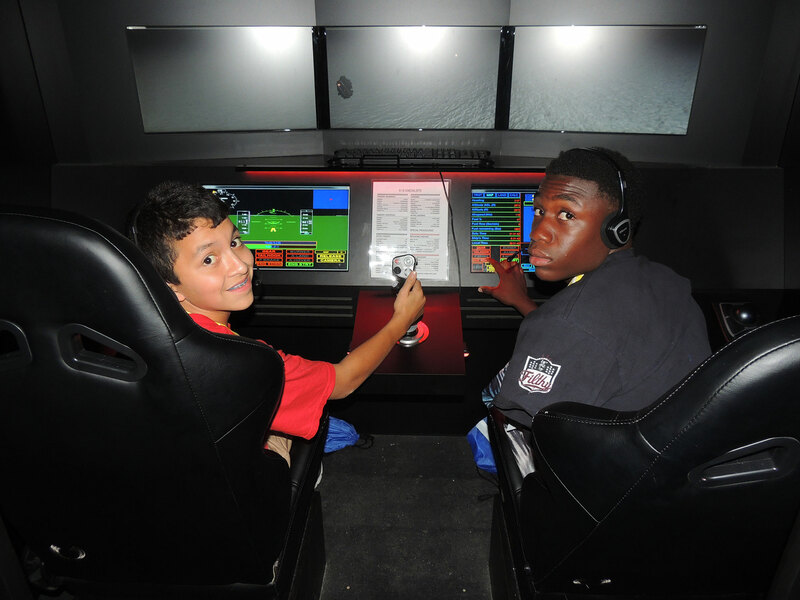 From the theme park-like sight and sound to premier technology available for students – the experience is meant to make it feel like they are actually serving aboard a real U.S. Navy aircraft carrier. Ambition Experimental Pilots (AXPs), as the students are called, become fundamentally aware of the integration of mathematics and science into their daily lives by measuring, collecting, analyzing and interpreting data. Critical thinking, communication, collaboration, creativity and other learning skills are valuable assets the students gain from the experience. The NFA was kind enough to allow RocketSTEM to have one of our staff members (shown on the left side of the above photo) go through the six-day deployment last summer. He was an incoming high-school freshman at the time, and the experience was the highlight of his summer. I had an amazing and unique experience at the National Flight Academy. It looked like a real aircraft carrier inside. There were sounds of planes taking off. I felt immediately welcomed. The camp had a very inviting feel. We were separated in to “CAGs” which is like the big overall groups. There were three CAGs, a CAG with the older kids, a CAG with the freshmen in high school, and a CAG with anyone younger than them. Within these CAGs there were three different squads. 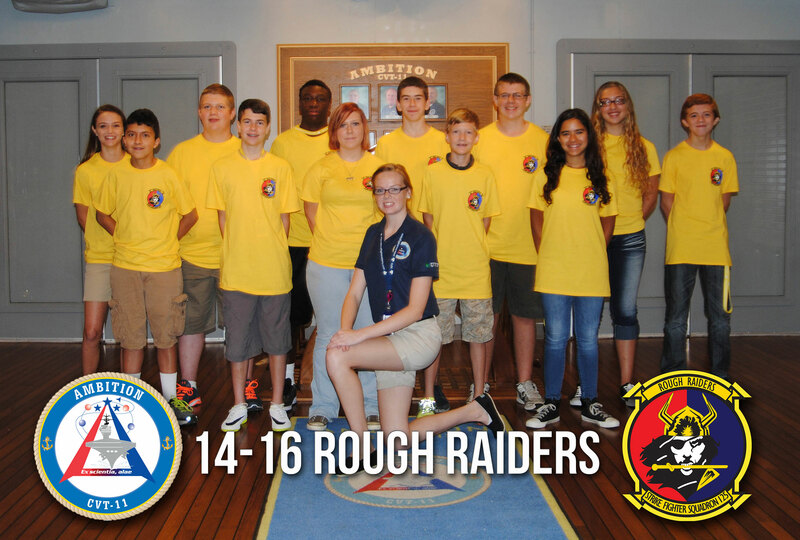 I was a part of the “Rough Raiders”, and in my CAG there were also the “Yellow Jackets” and the “Scorpions”. When I showed up they put me at a table that had my squad all sitting at it. They had us remotely take a test over naval terms and flight basics, then the camp started immediately. The first thing that you noticed was the look. From the outside it looks like a big gray box with the occasional fake porthole on the sides. When you walk through the hallways, there are things like AFFF, or fire fighting material, hoses, and different items along the walls. We went and did our first rounds. We flew, ran comms, and planned missions. We flew experimental triad jet simulators, with hover capabilities which are capable of mach 3 and reaching 90,000 ft. in altitude. We ran comms in the JOK. Running comms meant giving the planes headings, clearing them to take off and land, and helping them when needed. Planning missions happened in the JIK. We would find the speed that we needed to go, the fuel required, the true course on how to get there. We did those three just in the first day. While one squad was running comms, one would be flying and the other would be planning the missions. We flew in the simulators the first day through a obstacle course. We got a late start, so we were working until around ten o’clock. The flight simulators were amazing. There were three screens across the front like a cockpit window. 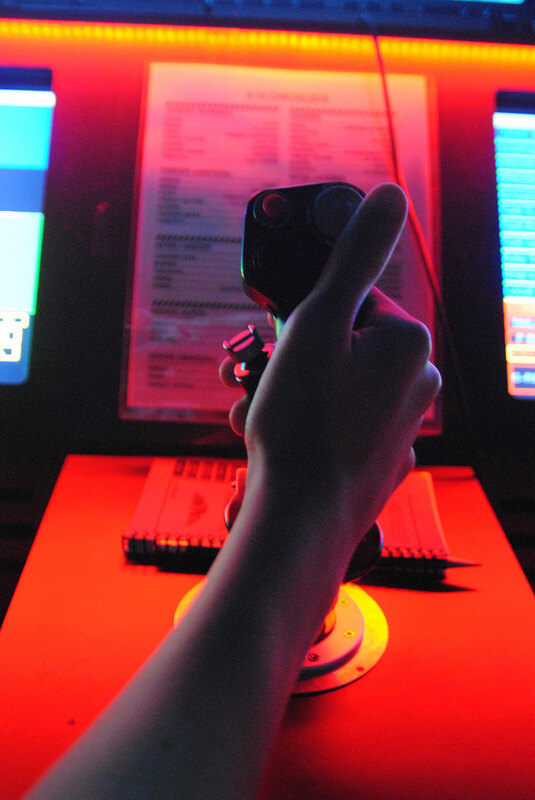 There was a joystick in the center and throttle, rudder control and flaps on the left. On the right there was the co-pilots seat with a mouse that you could turn on comms to talk to the tower. In the center there two touch screens that would show your horizon, speed, altitude, bearing, heading, would allow you to control the burner, which is like turbo, and the fuel indication. We then had thirty minutes of “hygiene time”. After that we settled into our rooms that had three bunks. Most of my squad members were in my room. Lights out were at ten thirty, and that was just the first day. The second day we woke up to yelling RAs at 06:30. We met in the lounge until 07:30 when we headed down to breakfast. The food was amazing. Between burgers, tacos and pasta, we rarely left food untouched. We would do our rounds of the JIK, JOK and flying usually twice a day. The second day we only did it once because we were still having things explained to us. That day we planned missions, ran comms and flew in a hover obstacle course. This was the first day that we met our morning Squad Chief. She looked somewhat like Emma Stone and was awesome. Our Night Chief was equally, if not more, awesome. We did evening games with him that included ninja, invisible ball and face off. Face off was fun because you asked the person that you were facing off against random questions and it made you think on your feet. In categories, one member of a squad would often go against another member of another squad. The ref would call out a category, like a fruit, and the first one to say something in this category would win and face the next challenger. Before we flew or ran comms, we would meet in a briefing room with one other squad. That night we played games and had “hygiene time”. The third day we woke up bright and early to one of the most intense days. We ran one of our first true missions. We searched for illegal planes. There was a 180 degree field that was 120 nautical miles across. Each group within a squad (a pilot and a co-pilot) would cover a sixth of the semi-circle. It was difficult because you had to fly low to the water in a zig-zag pattern to look for ships. Once you found one you would hover over it and send pictures to whoever was running comms for my airplane. Then not only did we do that, but we also practiced the following day’s mission, which was formation flying. We elected one flight group, which was Chi-Chi and Olga to lead the flight formation. I was more or less second in command and helped keep everyone in line. We did awful. Our original formation was the leader in front with two people to the left and right, two people directly behind them, and one person in the back middle. Our squad didn’t communicate well. That day was awesome mainly because that was the day that we got our call signs. A call sign is like a nickname in the military. Mine was Gizmo, but there were others like Ohioooo, Olga, Chi-chi, Raven, and Tina. That day we had a surprising amount of free time and I had an intense multi-puck air hockey match with a kid from another CAG. The next day was one of my favorites. This was day that we did the air rally and more formation flying. This time when we flew in formation everything went perfect. Everyone was in their spots and flew perfectly. Our new formation that I came up with was the leader in the front, I was directly behind him, one group to my right and left, and two people behind them. After this we were briefed on the air rally. An air rally is basically an air race and obstacle course. We had to hover and take pictures, pick up cargo, do a touch-and-go, and do a hover obstacle course through pillars. It was intense because you could see the other planes and how well they were doing if they were in front or behind you. This is also the day that we got our “motto”. There was a member of our squad whose call sign was Ohio. We would call out his name but emphasize the O. It would go something like Ohioooooooo. The air rally was very intense. I had one of the best times but they never announced who officially won. The air rally was probably my favorite of all the activities. That night we planned the next day’s mission. We planned a cross-country mission that would take almost two hours. We woke up to the Navy’s anthem over the intercom. We met in the lounge and went to breakfast. Then there was a blaring horn over the intercom. There was an emergency briefing at the breakfast tables for an emergency mission that canceled our cross-country plans. We had to run cargo to the Ambition from an oil drill and then fly to a sinking cruise ship. We then had to save the people that fled the sinking ship. Once they were flown to the nearest airport, we had to dissipate the gas that was released from the tankard that the cruise ship collided with. In the end there were no casualties. Being the final night at camp we should have been allowed to stay up until 11:00, but someone set off an Axe deodorant bomb and we had to go to bed at 10:30. You could smell it all down the hallway. The final night we had to go to bed early, but the girls could stay up until 11:00. We planned on meeting in the commons area but that idea was no longer applicable. I had the idea to Facetime the girls across the hall, which ended with us having our door propped open. I think that we were up until 1:30 that night. The final day crept up on us and before we knew it, it was graduation. We were allowed to sleep until 07:30, ate breakfast, and had free flying time. We were then told about how graduation would work and we made our way to the Blue Angel Auditorium in the neighboring National Museum of Naval Aviation. Each person was called up to the stage and given a patch and aviation wings. When Ohio graduated we all called out his name. The fun didn’t stop at graduation. Afterward we could take our parents around and show them what we had been doing for the past week. And after that, the museum was open to campers and their parents. This camp was amazing and I will always look back on it fondly. Located adjacent to the National Naval Aviation Museum, the National Flight Academy is a 102,000 sq. ft. four-story structure designed to be fully and intensively immersive. The NFA’s adventure begins with our landlocked, virtual aircraft carrier, Ambition (CVT-11). Each deck of Ambition is designed scenically and theatrically to simulate a modern aircraft carrier. The first deck houses the galley, mess deck, administrative spaces and the aircraft hangar bays. The second deck is dedicated to academic spaces including the operations and intelligence centers. The third and fourth decks house berthing (crew quarters), lounges and activity rooms. The facility is designed in compliance with the Americans with Disabilities Act. Everyday the schedule begins at 0630 with reveille. Ambition Experimental Pilots (AXPs) are given time for a shower and personal care, nutritious breakfast, and called to their assigned stations by 0800. AXPs will be briefed on the days’ action-packed mission and will work together to create a master plan, flight map, and debrief following the completion of every mission. Each mission will test AXPs’ mental agility, preparedness, and communication skills, while demonstrating the importance of teamwork and goal completion. Through consistent simulator experience and immersive role-play, AXPs will have ample opportunity to see firsthand how those in Naval Aviation respond to and avert emergencies in real life. Later on, AXPs will also have a once-in-a-lifetime opportunity to watch the famous Blue Angels (when available) practice barrel rolls and aerobatic formations with an unobstructed, front-row view of the fun! Following an action-packed week, the Ambition Experimental Pilots’ squadron Commanders and the Captain will host a graduation ceremony to celebrate the AXPs’ major accomplishments. The ceremony will include awards, personal recognition, and inspiring activities surrounding this exciting accomplishment. Family and friends are invited to attend graduation ceremonies. These are the spring/summer session dates for the six-day deployment programs for children in grades 7-12. Adventure Saturday: Introductory program for grades K-12. Cruises: Three-day programs for grades 5-12. Adventures: One-day youth program for groups. A great for option for scout troops. The National Flight Academy accepts scholarship applications for deserving students to attend the six-day program. A limited number of $500 scholarships are available for the 2015 program. If you would like to learn more about the National Flight Academy scholarship program, please email boost@nationalflightacademy.com. This article appeared in the February 2015 issue of RocketSTEM.